This interesting tale is a coming-of-age story of Callie Hall and how her first real witching encounter displays her unique powerful skills. With her family threatened, and her best friend, Josh, in the mix, how can Callie ready herself for the dark force of nightmares? I liked the premise of this book, and I found the plot build-up interesting. I really feel that, although the age of the characters are 15, that this book fits really well with the Children’s and Middle Grade genre it’s in. 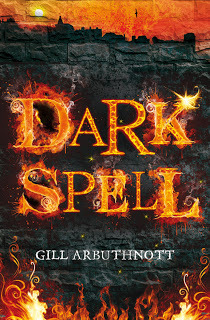 It’s a nice little paranormal fantasy, and I was beyond pleased that romance did not play a factor in Dark Spell, but the situation, wording, dialogues and actions felt a bit stiff. Callie’s constant insecurities and self-esteem issues struck a bad chord with me, but other than that the characters are pleasant. I must say that I did not like how Callie’s familial relations are not displayed as simple pronouns like “mom,” “dad,” or her “grandparents” because using the adults first name’s got really confusing and I had to constantly remind myself of how they are related to one another, and Callie. Even if I saw the names separately right at this very moment, I still wouldn’t be sure on who is who. I love how the story is told in third person, so as the reader can get a better experience in the adventure’s outlook, but I think that better transitions could have been used between character point of views to avoid confusion. Better transitioning probably would have been better at the beginning when the time spans kept spreading in a matter of paragraphs. In all, I believe that this is a delightful tale for those of the younger generation. I could easily have seen myself reading a tale like this in elementary or middle school. I love the plot and the frightening supernatural twist it takes and how much more interesting and different it makes the story. The ghost of a witch? Great stuff! I would recommend this book for the younger crowd who love to dabble in paranormal fantasies and witchcraft, and who are as tired of reading about romance in everything, as I am.